Abbey Wood history books are not just for local historians; family historians can add flesh to the bones of their basic research by finding out more about the location in which their ancestors lived. 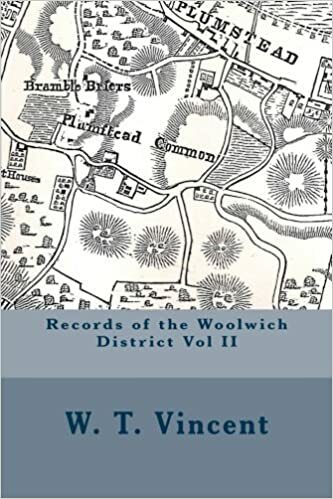 Although there doesn’t appear to be any dedicated Abbey Wood history books, Records of the Woolwich District, vol II, originally published in 1890, and recently republished by FamLoc, has much information on the area which is now known as Abbey Wood, and is an important asset for local and family historians. Click HERE to buy Records of the Woolwich District vol. II. “But let us pursue the old road of which we have been speaking and trace the bygone memories of Lesness Abbey and Abbey Wood. Abbey Wood is only in part within the parish of Plumstead, but the spot on which the abbey stood is too inextricably associated with Plumstead history to be omitted from its records. To-day we find Abbey Wood and its neighbour Bostall Heath preserved in all their natural simplicity and beauty, while the hills to the westward and the eastward are peopled with townships. “The Abbey and Roman Dock. Far back in our history, when King Henry II reigned, in pious conflict with the priesthood, the Saracens, and the French, the small but wealthy abbey of Lesness stood by the brink of the broad waters. Still farther away in time, perhaps when the Romans dwelt as conquerors in England, the early shipbuilders had here a naval station at which they built their ships of war and of commerce. With the deep hollow close by the ruins of the old abbey tradition has always associated the name of “The Roman Dock,” and, although tradition alone is a bad witness, tradition supported by collateral facts is always receivable as evidence. The dock is partly a natural “slade” and partly excavation. There are manifest signs of its having been deepened in places, and the angular protuberances on the banks, which are like nothing in nature, were, I imagine, formed by heaps of soil scooped out of the basin (Plate LV, Chapter XL: The Early Days of Plumstead). The likelihood of the Romans having previously built the river wall has already been mentioned, but, admitting the assumption, it is quite reasonable to suppose that before (and even after) that work was accomplished, a navigable creek or canal stretched to this spot. All we see of this channel to-day is a mere ditch across the marsh, but in some old maps it is represented as a respectable river. The dock may have been maintained by a dam piled against the entrance (just where the road is), easily cut when a ship was finished and a favourable tide available for floating out.I know that in advancing this hypothesis I have to confront the fact that it has never been taken up or entertained, so far as I am aware, by any other writer, but I venture to declare my entire faith in the tradition of the Roman dock, and submit, at least, that the evidence is plausible. It must be conceded that the Romans, the Danes, and other early shipwrights, would build their vessels somewhere near the capital, and, apart from tradition and probability, I would ask if anyone can find a situation and a conformation so suitable and convenient for the purpose as this? Remains of primitive boats have been dug out of the peat in this part of the marsh, and, although such discoveries merely show that the marsh was flooded when the wrecks occurred, they are to some extent in favour of the dock theory. Click HERE for more information and the option to buy the book. We are always looking for more Abbey Wood history books to display, and welcome suggestions. We are doing our family tree and have come to a dead end. We are hoping you can help! We are looking for any information about Goldie Leigh lodge from between 1848-1902. If you could point us in the right direction we would be most grateful.